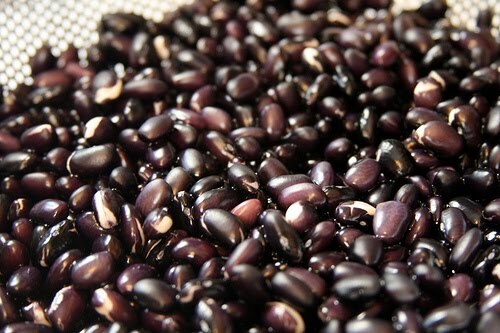 This week’s Stretchy Bean is Black Beans specifically Black Turtle Beans. I love black beans. My family loves black beans (maybe not as much as I do but they still enjoy them). We actually have black beans on our 13 Week Menu three different times. Week Six has already been posted and you can see what we did with the black beans that week. I was amused to discover that this week my all three of my Black Bean recipes link back to the GNOWFGLINS site run by Wardeh and her family. I do link there quite often anyway but thought it was funny that I found three terrific black bean recipes there. Maybe Wardeh likes black beans as much as I do? Actually, Wednesday night’s Black Bean and Beef Skillet Dish is more of a method than a recipe but Wardeh does a spectacular job of laying out the method and offering ingredient ideas. Our skillet dish will be made out of beef stew meat and black beans but I’m not sure what else until I actually get in the kitchen. I’m thinking it will have some sort of a creamy sauce maybe with milk and nutritional yeast but we’ll see. On Friday night our dessert will be Sourdough Chocolate Cake with Dark Chocolate Frosting. Both of those recipes are also from Wardeh. I wanted to mention the Dark Chocolate Frosting specifically. This is a dairy free recipe that uses coconut cream (the recipe also calls for Agave but we use honey instead). It is very dark and very delicious. For the coconut cream, I put a can of regular coconut milk in the refrigerator. After a few hours the cream is kind of solidified on the top and is easily scooped off. I scoop off the 1/3 cup for the frosting and the rest is saved for another use (I put it in a mason jar). This week I did it a bit backwards (I do that sometimes) by using the coconut milk first (Tuesday night’s dinner) and saving the cream in a mason jar to use later in the week. I find that the little bit of missing cream doesn’t usually make a difference in most dishes and gives me a very good excuse to need to make a cake or frosted donuts later in the week. Plus I like to think it saves me money not using the entire jar of coconut milk at one time but then maybe it doesn’t since I have to bake that cake. Either way, it’s what I do.